It's been such a rough week that I'm so behind on my cooking and baking schedule. But thankfully, friends are more patient when they know good food is on the way, right?! This week I was asked to select the Project Pastry Queen recipe for the group and being that we're at the end of October, I thought a baked treat using pumpkin was in order. As a result, I chose Pastry Queen's 'Edie's Autumn Pumpkin Bread with Streusel Topping.' I'm all for making recipes as written but I find more pleasure in tweaking them to make a dish my own. 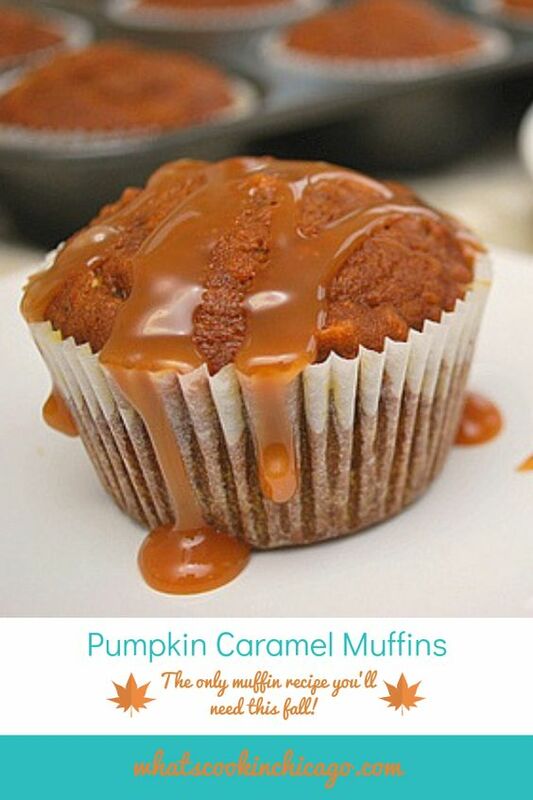 With this recipe, I made some adaptations (as usual) and came up with this spin, Autumn Pumpkin Caramel Muffins. Yum. It's more fall deliciousness in a perfect serving! These muffins are so flavorful and have a very moist and tender crumb. I think the pumpkin has to take credit for that and it really shines with every bite of the muffin. The original recipe called for pure pumpkin but I only had pumpkin pie filling on hand. 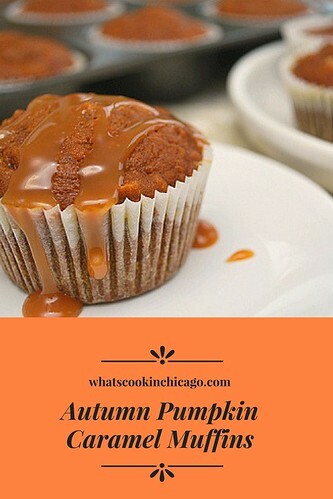 The difference is that pure pumpkin has no additional spices or sweeteners mixed in. By using pumpkin pie filling instead, it added some spices to the batter in addition to the original spices called for in the recipe. With this adaptation, there is more spices used which really added a lot of nice flavor. But if you're leary about all that spice, you can use pure pumpkin with the spices noted or use pumpkin pie filling and omit the spices noted. I thought I had pecans on hand but not so. As a substitute, I used rolled oats instead. They were a great substitution that added some additional texture and nuttiness. In the process of preparing the topping, I in inadvertently threw the topping mixture into the batter and stirred it in... oops! But surprisingly, it was fine and didn't affect the baking texture at all. If anything, it added a bit of buttery, caramel notes. As these muffins baked, I thought about how I'd top them off since my topping attempts failed. 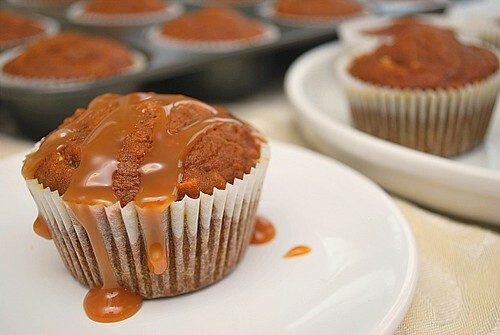 To play on the caramel notes, I drizzled some caramel ice cream topping over the muffins. The result? Delicious success! Alternatively, you can prepare this recipe as a loaf of bread instead of muffins. To do so, grease a standard size loaf pan and pour the batter in, top with the streusel and bake. Preheat the oven to 350 degrees. Line a muffin pan with liners and set aside. Whisk the oil and sugar in a large bowl. Add the eggs, pumpkin, and water and whisk until combined. In a medium bowl, combine the flour, baking soda, spices and salt and whisk. Add this flour mixture to the bowl with the eggs, pumpkin and water and stir to fully incorporate. Fold in the 1/2 cup of toasted pecan pieces into the batter. Fill the lined muffin pans almost to the top with the batter; set aside. To make the topping, combine the sugar, butter, cinnamon and the 1/4 cup toasted pecan pieces. Sprinkle the topping liberally over the muffins before baking. Bake the muffins in the preheated oven for 30-35 minutes. To garnish before serving, drizzle on caramel topping. Yummy cupcakes, nice and simple. Pumpkin and Caramel???? May have to try these! The muffins look good and pretty. I would love to try this one. Looks easy.